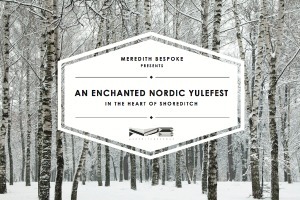 Events agency Meredith Bespoke has announced plans to open an 'enchanted Nordic Yulefest' in Shoreditch, east London, targeting companies' end-of-year festive celebrations. Available to hire from 1 December for lunch and dinner bookings, the agency has promised the experience will be a ‘birch tree-lined fairyland’ and will feature sheepskin nooks, antlers, a Nordic Santa Claus and marzipan pigs. A Polaroid camera wall will also be available. Food and drinks will be presented as a rolling feast by Scandinavian restaurant Fika and Meredith Bespoke’s head chef Daniel Cohan. The menu will include Christmas classics with a twist, such as apple-stuffed hams and gravalax, while the cocktail menu will feature sandy slaws, nutty sours, Yule smacks and Gluehwein, to be drunk from a boot-shaped glass. After dinner, guests will be guided upstairs where DJs, crowned with evergreen headdresses, will play music for the ‘Dance of Candlelight’. The Yulefest will be located on the second floor of 1 Kingsland Road. The venue, which can be hired exclusively, can accommodate a maximum of 200 delegates for a bowl food or canapé reception. Lunch packages start from £60 per person, with the dinner offering starting at £120 per person.